This essay by Natalie Shea was originally written for the CD “The Gentle Muse” featuring Jane Edwards, soprano, and released on the Artworks label. It has been excerpted and edited specifically, with the author’s approval, for Ludovico’s Band’s Melbourne Recital Centre concert ‘The Voices of Women’. To a 21st century audience, it is hard to imagine audiences clamouring for new music in the modern style. We live in an age where the music of dead male composers sells and the mainstream concert-going public turns up its nose at anything unfamiliar. But in Italy around the turn of the 17th century, a completely new musical style was sweeping the boards: the solo instrument or voice accompanied by one or more instruments able to provide the supporting harmonies, which were indicated on the musical score by numbers over the bass line (‘figured bass’). This was a radical departure from the established norm of polyphonic music, with its multiple independent vocal or instrumental lines all weaving around each other to create the harmonic texture. The new secunda prattica as it came to be called did not replace the older prima prattica, but it generated much heated controversy and quickly became immensely popular. Secunda prattica prized above all the texts being sung: whereas in polyphonic writing it had become extremely difficult to pick out the words from among the threads of the musical texture, monody was designed to highlight the melodic line and make it possible for singing to be as expressive as speech. At one extreme, this led to the recitative style, where the singer is largely free to follow the rhythms of speech and the harmony follows the melody, changing only occasionally, on important words; generally, pieces in this style were settings of prose. At the other extreme is the aria style, which has a fixed metre and a sense of regular alternation of heavier and lighter syllables, and tends to set texts written in verse. With secunda prattica came another innovation: opera, and with that phenomenon came a major shift in the culture of music performance. Opera, with its recitatives and arias capable of representing the rhythms of the language and exploiting the elaborate conventions of rhetoric to bring all the power of speech into music, provided a showcase for the solo voice and especially for the soprano voice. Women now began to have access to a new career: the opera singer. Although the popular association of female musicians with courtesans persisted, it was possible for a woman to achieve great renown and immense wealth on the operatic stage. One of the first composers to write operas was Giulio Caccini, who was also the author of the seminal description and defence of secunda prattica, Le nuove musiche (1601/2). The Caccinis were a musical dynasty: Giulio’s first and second wives, his son, two daughters and at least one granddaughter were all active musicians, trained by him in the new music. His elder daughter, Francesca Caccini, was a singer of great renown, and one intimately acquainted with opera: at the age of 13 she had appeared in one of the very earliest operas, Jacopo Peri’s Euridice. Four years later she was headhunted by Queen Maria de Medici of France but was obliged to turn down the offer as the Medicis in Florence, by whom her father was employed, refused to let her go. In 1607, she officially entered the service of the Florentine court; but interestingly, the catalyst for this appointment was not Caccini’s fine voice, but the ‘stupendous’ music she had just written for the carnival entertainment La stiava. Caccini was active as a composer by the age of 18, and wrote a large number of secular and some sacred pieces. She also wrote opera: her La liberazione di Ruggiero dall’isola d’Alcina (published in 1625) is the earliest opera score composed by a woman that has survived to our day. Unfortunately most of the rest of her music has now been lost, but the one collection that has survived, Il Primo Libro delle musiche a una e due voci of 1618, was at that time the most extensive collection of secunda prattica music by a single composer. It includes a range of musical genres—sonnets, madrigals, arias, romanescas, motets, hymns and canzonettas—arranged in an order which suggests that the volume may have been intended to be used a textbook for young singers. That Caccini characteristically wrote out the ornamentation may be further evidence of this: the ability to improvise appropriate embellishments was an important facet of the singer’s brilliance, and students of singing were extensively trained in this skill. Instructing women of the court (including princesses, ladies-in-waiting, younger serving women and at least one nun) in the art of singing was an important part of Caccini’s duties, and official chamber music at the Florentine court came to be dominated by ‘la sig.a Francesca e le sue figliuole’ (lady Francesca and her pupils). The courts of the nobility were not the only environment in which women composers could flourish: the convent also provided important opportunities for musical performance and composition, and the new secunda prattica style had an enormous impact here as it had in the secular world. In the convent of St Ursula in Novara in northern Italy, the Collegio di Santa Orsola, figured bass was taught as well as Gregorian chant, and it was here that Isabella Leonarda spent most of her life and published close to 200 works in 20 volumes. Leonarda entered the convent at the age of 16; her first works were published four years later. By 1676 she was mother superior of the convent; in the dedication to her Op.10 of 1684, she writes that her music is composed during the time allotted the nuns for rest, so as not to neglect her administrative duties. Leonarda wrote in almost every genre of sacred music: masses, psalm settings, magnificats, instrumental sonate da chiesa (church sonatas)—apparently the only ones written by a woman published during the 17th century—litanies and a hymn. Most of her compositions, however, were motets for up to four voices, and most of these—96 in all—were motets for solo voice. Interestingly, quite a number of Leonarda’s solo motets were for bass voice; it is not clear whether these works were for performance by male clergy or on special occasions when the convent hired extra singers (despite the disapproval of church authorities at the nuns’ mixing with musicians from the outside world), or whether they were written for private devotional services held outside the convent. Gambenspielerin (The Viola da Gamba Player), c. 1630–1640, (Gemäldegalerie, Dresden) by Bernardo Strozzi, believed to be of Barbara Strozzi. 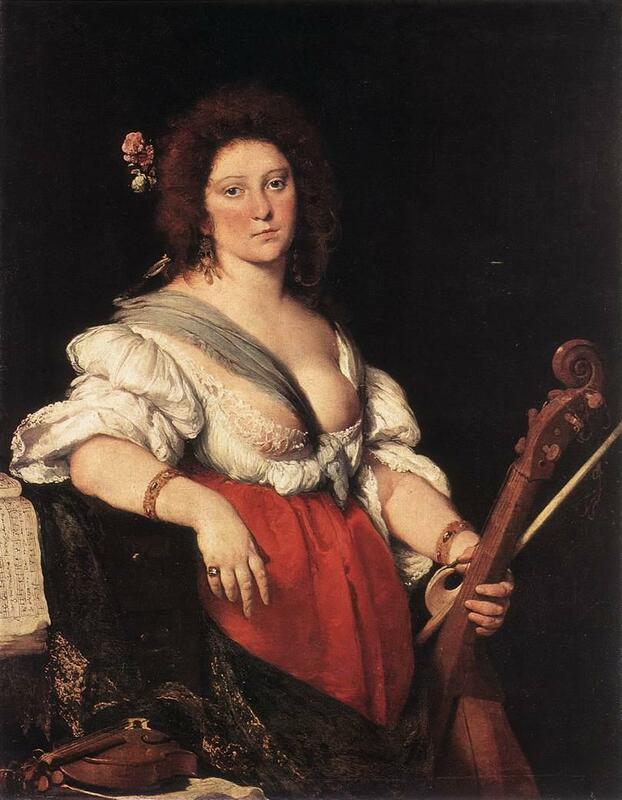 Perhaps the most remarkable woman composer of 17th century Italy was a product of neither court nor convent: Barbara Strozzi’s talents seem rather to have been nurtured by the particular intellectual and cultural circles in which she lived. Her (possibly adoptive) father, Giulio Strozzi, was an important Venetian poet who wrote librettos for many operas, including works by Monteverdi and Cavalli; he was rich not in money but in associates, being a member of the Accademia degli Incogniti, which counted among its members nearly all the intellectuals of Venice: poets, philosophers, historians and clerics. In 1637 he founded his own academy, the Accademia degli Unisoni, which seems to have functioned as a musical subgroup of the Incogniti, and it was at the meetings of the Unisoni that Barbara Strozzi gave her performances. Strozzi’s singing was highly praised by those who had the good fortune to hear her, but her public career was established not through performance, but by publishing. She was one of the most prolific composers of secular chamber music in the 17th century, and she published nearly all of her cantatas herself. (The more normal rate of publication was around 3% of a composer’s works.) Between 1644 and 1664, Strozzi published over 100 works in 8 volumes; a number of her compositions were also published in two other collections of works by “various most excellent modern writers” and “persons eminent in music”. Almost all Strozzi’s works are cantatas or arias for solo voice. Despite her father’s associations with opera, Strozzi wrote none: her works are chamber works, and the cantata, with its succession of passages in aria and recitative style, was opera’s chamber music equivalent. The texts are all love poems, many apparently written to order although for about half of the poems, the identity of the author is now unknown. As in Caccini’s canzonettas, the theme in Strozzi’s secular works is almost invariably the suffering caused by unrequited love, presented across the full gamut of moods, from ironic mockery to weeping melancholy. ‘One of the muses of Parnassus,’ declared one of Strozzi’s admirers in 1635, struck by the beauty of her singing. In classical mythology, the muses, to whom we owe the word ‘music’ itself, were representations of the ideal of supreme bodily and intellectual grace. In 17th century Italy, women had come to acquire an important role in music as performers, which could provide them with wealth and standing—but the domain in which they achieved this status was one which prized beauty. The respect for female singers was thus to some degree an extension of the view of women as essentially decorative. As composers, however, it was possible for women to attract a different kind of praise and recognition. ‘All the works of this illustrious and incomparable Isabella Leonarda,’ wrote Sébastian de Brossard in 1724, twenty years after her death, ‘are so beautiful, so gracious, so brilliant and at the same time so knowledgeable and so wise, that my great regret is in not having them all.’ Francesca Caccini, composer and teacher as well as singer, was in the 1620s the highest-paid musician on the Medici payroll. Both of these acknowledgments recognise their laureates’ skill and intelligence—qualities as inherent to the Muses as physical beauty. Although it was possible for gifted women to achieve success as composers, it was not easy. 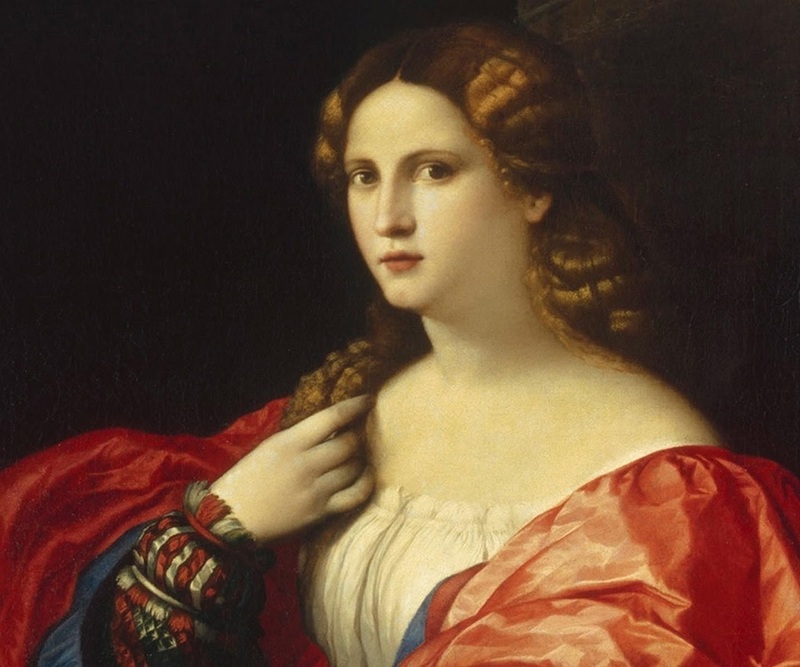 All three of the composers were greatly helped by their background and circumstances: Caccini growing up living and breathing the new music being developed by her own father, Leonarda in the convent, and Strozzi in the fertile intellectual surrounds of the Accademia degli Unisoni. And it should be noted that none of these women gained any great wealth from their work. The founder of the Accademia degli Incogniti, Giovanni Francesco Loredano, once wrote of Strozzi’s music: ‘had she been born in another era she would certainly have usurped or enlarged the place of the muses.’ If this comment expresses a regret that Strozzi’s music had not achieved the widespread fame it deserved, it also stands as an epitaph for the many women over many centuries who did not have access to the social and cultural resources enjoyed by Caccini, Strozzi and Leonarda, and as a call for a more serious examination of the women’s compositions which have come down to us. Ludovico's Band perform 'The Voices of Women' in Elisabeth Murdoch Hall on Tuesday 20 March 6.30pm. Click here for more information. Tembembe Ensamble member Leopoldo Novoa talks about playing with early music master Jordi Savall.